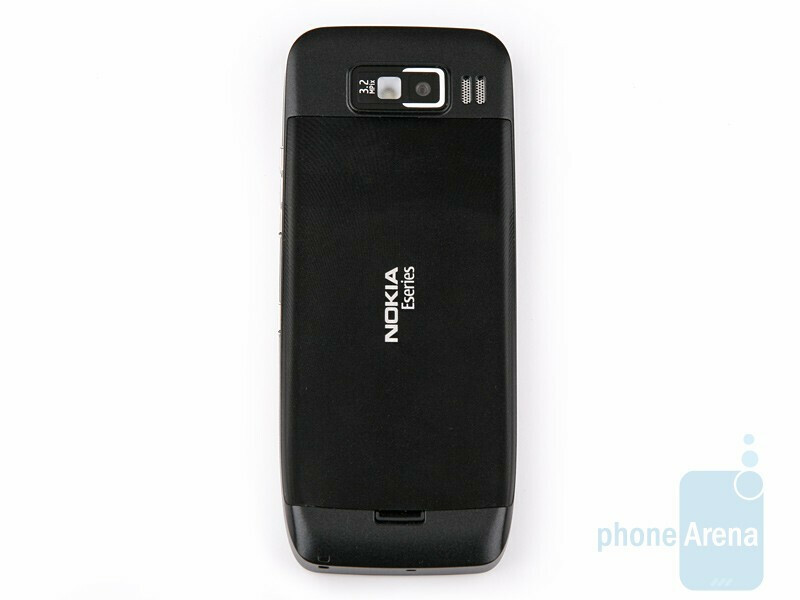 Nokia announced two new business oriented cell phones at the same time at MWC 2009 – the Nokia E75 and E55. We have already reviewed the former and are pleased with it. Now, it´s time we take a closer look at the second and see what it delivers. 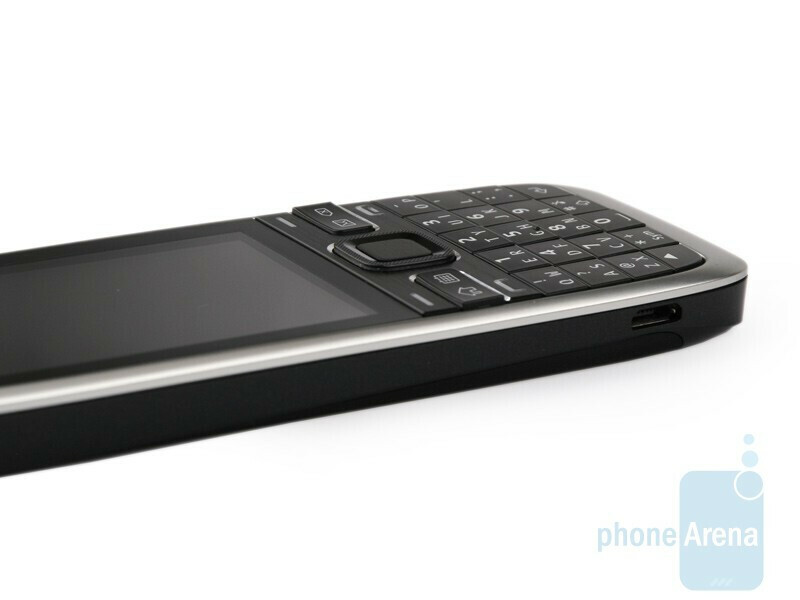 Today we introduce the Nokia E55 to you. It´s the manufacturer´s first attempt at a “compact QWERTY keyboard” that consists of 20 buttons. 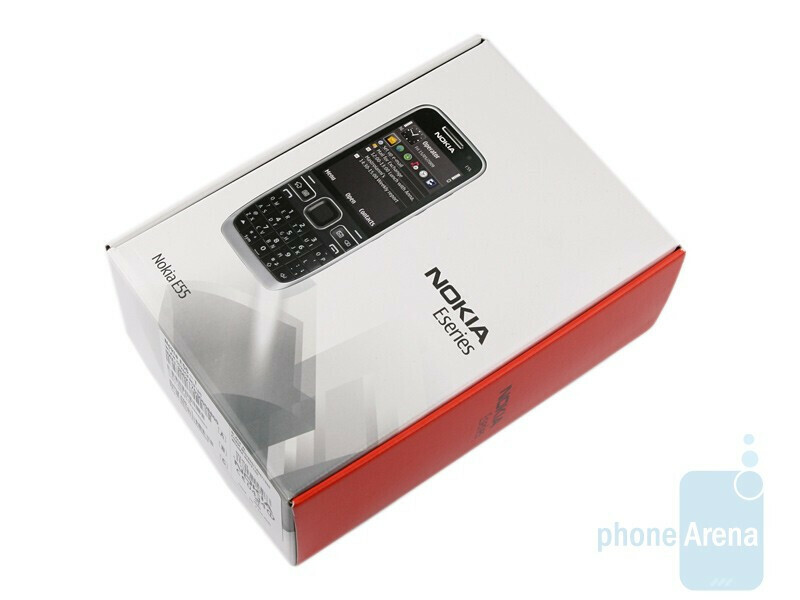 The handset sports the overall design style that we already know from the E66 and E71 and frankly, the Nokia E55 looks almost identical (aside from the keyboard) to the successor to the E51 – the E52 and has the same design, software and functionality. The phone also supports 3G and comes equipped with Wi-Fi, GPS and two cameras - a 3.2-megapixel main camera and an additional one for video calls. In a nutshell, it´s got what it takes to be a good business oriented device. The interface is not any different from the one on the E75 in almost anything, except for several nice novelties. We will certainly tell you what these are, but let´s first take a look at what is in the box. The Nokia E55 looks great on the outside. 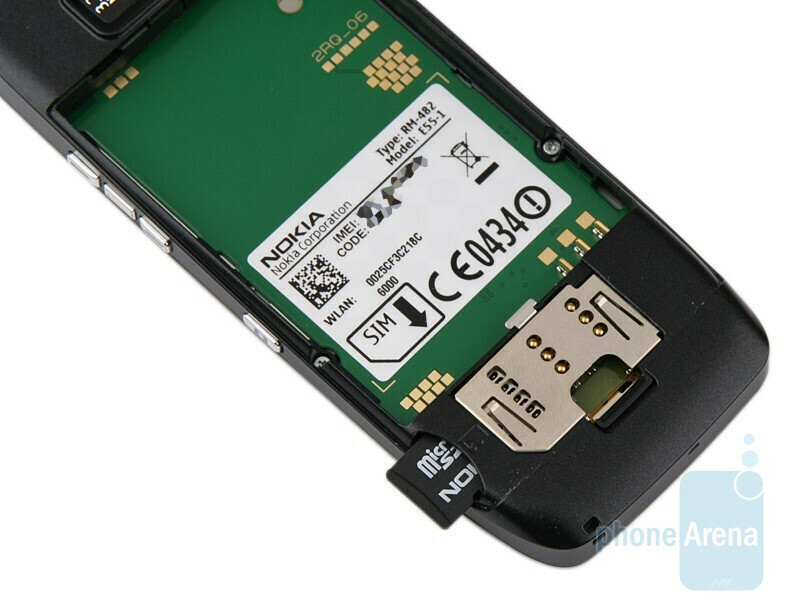 The manufacturer has used high quality materials and the handset looks elegant and austere, something typical for all latest phones of Nokia´s business lineup. Feeling cheap is light years away from the E55.. The overall size and weight are perfectly balanced and the phone is extremely comfortable to operate and carry around. You can compare the Nokia E55 with many other phones using our Size Visualization Tool. The device packs a 2.4-inch TFT display that supports 16mln colors and comes with a native resolution of 240x320 pixels. We are really pleased with its performance in direct sunlight, because it remains entirely usable and similarly to other Nokia models, it´s just colors that get worn-off. 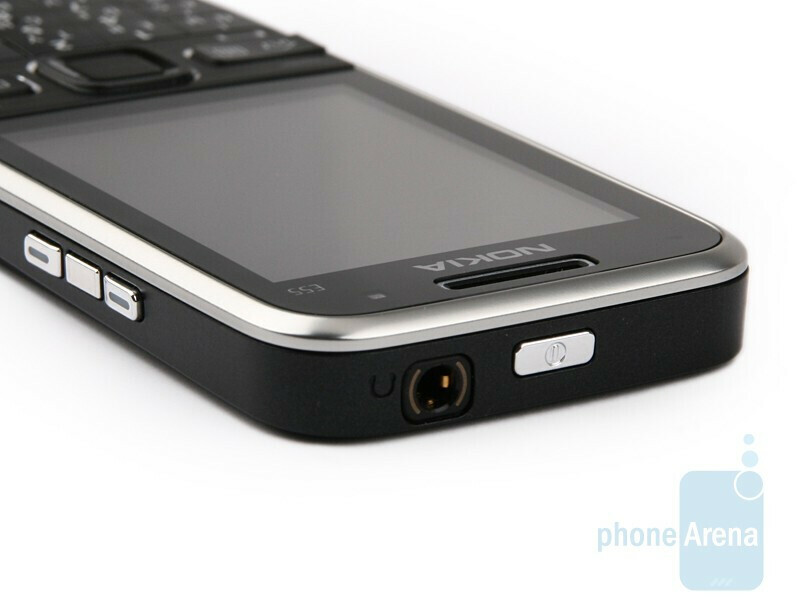 The light-sensitivity sensor, loudspeaker and video call camera are located above the screen. 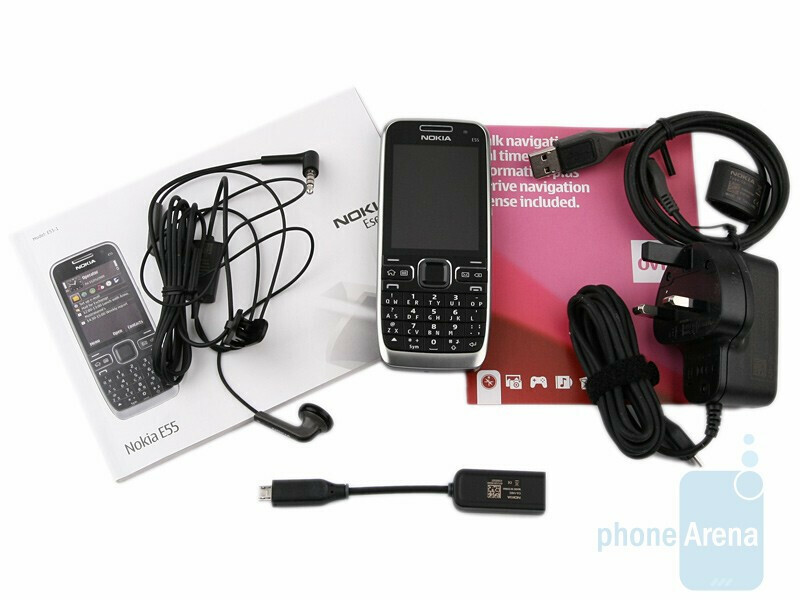 The navigational key alignment on the Nokia E55 is slightly different from what you can see on the E75 and the typical Eseries buttons that allow fast access to the organizer functions have a larger travel than the rest. We don’t mind this at all, because they don’t get in the way when pressing the send and end keys (virtually the most used buttons on any cell phone), which feels easy and handy. The 5-directional D-Pad sports a cool, rugged edge that creates really pleasant feeling and we don’t have any gripes concerning it either. 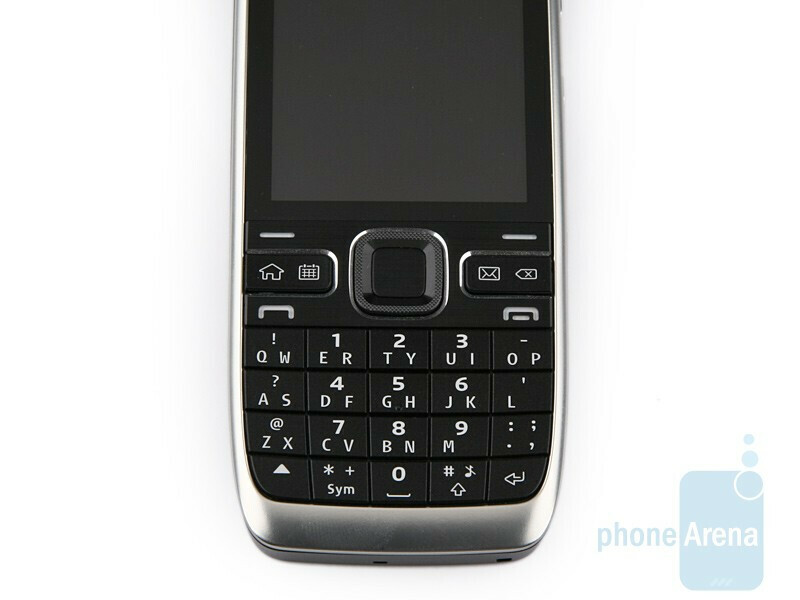 The most interesting element on the front side of the Nokia E55 and probably of the phone as a whole is its compact QWERTY keyboard. 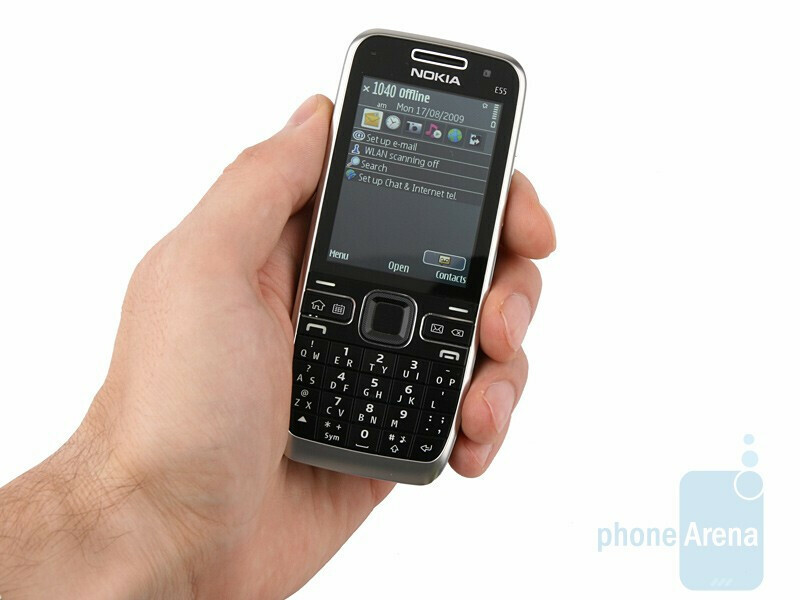 This is the first time Nokia has equipped a device with such a keyboard. Similarly to the SureType keyboards of certain RIM devices, it consists of 20 buttons, aligned in four rows. All of them are large enough, have nice travel and feel clearly discernible when pressed. We didn’t encounter any issues typing away with one handed entry, except when trying to reach the innermost buttons. Entering text using both hands feels passable, but we believe there´s room for improvement. People with thicker fingers might have certain troubles typing using both hands, because there isn’t enough space in between buttons, due to the compact overall size of the handset. We decided to try the standard numeric keypad of the Nokia E52 and compare the relative speed of entry. 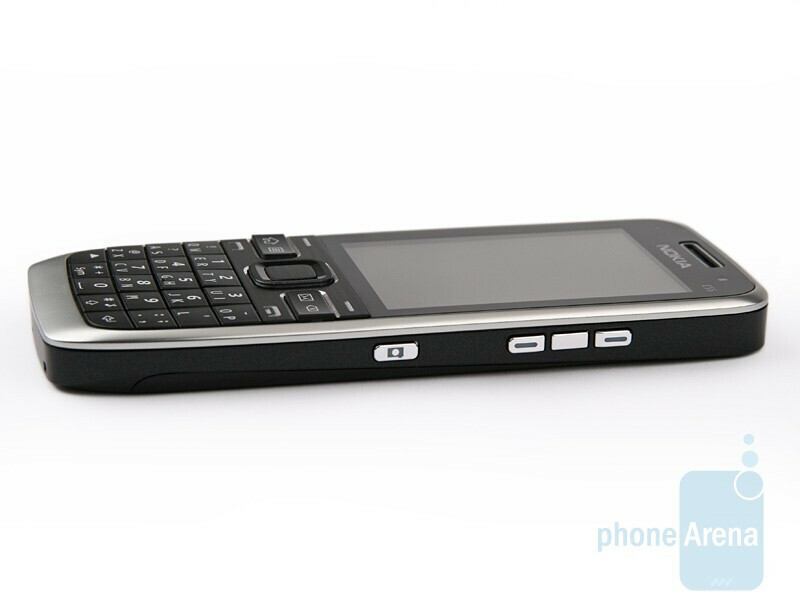 We found out the difference isn’t that big, but still typing with the E55’s compact QWERTY is faster. Ultimately, the first attempt of Nokia at a 20-button keyboard feels decent and proper to use so we rate it 8/10. The microUSB port is on the left hand side. It´s open and there is no flap to prevent dirt and dust from getting in. The power on/off button that is also used for switching between phone profiles is on the top side, next to what we were more impressed to see – a 3.5mm headphone jack. The right hand side of the device hosts the volume rocker, voice control and camera shutter buttons. We don’t have any gripes concerning any of them. "because the E55 8MP comes preloaded..." You guys at PhoneArena might want to fix that error in the paragraph you're talking about messaging. It's right above the pictures showing the email client. Somebody must've had the N86 on their mind or you're just trying to see if we're awake out here. Or you have something you might like to share with us all?? Thanks for the note! Unfortunately, we do not have information about something that interesting like an 8MP camera on the E55... Obviously, it was the N86 8MP that was on our mind, while writing this review. We are sorry for the mistake, it has been fixed. Anyone know when the E55 will be released for the US? "Voices of people sound too loud, yet muffled and fuzzy and sometimes they get illegible" What's up Phonearena? Sounds too loud yet muffled? Aren't those words quite contradicting? When on Earth can a muffled sound be considered loud? I'm sorry but in as much as I would like to comprehend, I just can't understand what you mean by that. Anyone who can explain? It's actually what I want the most in this review as I don't want to get into trouble during calls.